SHEPARD ASSOCIATES, ARCHITECTS & PLANNERS, INC. Architect: Shepard Associates, Architects & Planners, Inc. It is the intent of the Owner to serve as Construction Coordinator. No bid guarantee is required. ment will be for its own best interest. on file at the Owner's office and at the Architect's office. plete, in good shape and in a timely manner. payment of 25 per page. Board, Post Office Box 1987, St. Augustine, Florida 32084.
into an agreement to perform any part of the work specified herein. or through an authorized representative. posal for any part of the work contemplated. taining to the work to be done. in any of the contract documents. tract sum (if required), with surety satisfactory to the Owner. Modifications and Additions to Agreement & General Conditions. him of the obligations and responsibilities assumed under the contract. and its receipt by the bidder should be acknowledged on the Bid Form. for or irregularities of any kind may be rejected by the Owner. his principal may be held to be the bid of the individual so signing. signing for a partnership or an individual shall be furnished. ted on the Proposal Form and delivered or mailed to the Owner. in which the prices are obviously unbalanced will be rejected. ture opening of a bid not properly addressed and identified. will be read by the Owner or Architect prior to the opening of bids. phic request received from bidders prior to the time fixed for opening. right for the withdrawal of the bid after it has been opened. of the Owner to accept them. when such waiver is in the interest of the Owner. ject the bid of a bidder who is not in a position to perform the contract. Subcontractors shall furnish bonds if required by the Owner. name of the partnership by the manual signature of a partner or partners. may not execute the contract and authenticate the document of authority. same manner and by the same person who executed the contract. the requirements enumerated herein is sufficient. equipment, materials, etc., have been specified by name or manufacturer. affixed his seal this day of . as not in the Contract. by the Owner. Said items are noted in the specifications and/or drawings. to serve as the Construction Coordinator. portions of the work as required. or noted as not in Contract. Alternates shall be stated separately in the Bid Proposal. all trim, caulking and painting. (b) Interior doors and frames. (c) Interior millwork or casework. (d) Air conditioning unit ductworkk to be included in base bid). items of temporary construction and facilities. use, provided they pay for toll calls. connections as required, and remove same upon completion of the work. to be maintained for the work of the various trades. Furnish, from a proven safe source, for all those connected with the work. single service containers or by sanitary drinking fountains. when permanent toilets are made available. for exterior wall openings of building until it is dry. Windows may be glazed in lieu of covering if glass is protected. by lack of, or inadequate protection. 4 x 4 feet in size, of 3/4-inch exterior grade plywood, without frame. (4) Contractor and principal subcontractors, as directed. or rigidly mount on building as directed by Architect. PLACE NO OTHER SIGNS OR ADVERTISEMENTS ON THE PREMISES. with any applicable Federal requirements. ANSI American National Standards Institute, 10 E. 40th St., New York 10016.
ciation, P. O. Box 1337, Tacoma, Washington 98401. 50 South Los Robles, Pasadena, California 91101. UL Underwriters Laboratories, 207 East Olive Street, Chicago, Ill. 60611.
mean the edition current on the date of the Invitation to Bid. prior to ordering material or equipment. enable the Architect to determine whether same meets specifications. bility for performance of any terms of the Contract. his standard practice, directions or specifications. fore substitutions will be allowed. shall be so stated on the request. nation between the trades will require more time than this specified amount. or mentioned in the specifications as being the acceptable item. shop drawing use without written approval of the Architect. mit more than the required number of copies. cal Contractor's "Transmittal Letter" which is available from the Architect. cause rejection of the submittal. chures) when the review is completed. each group of shop drawings common to a specification section. val if the notations are acceptable to the Contractor and/or subcontractors. required the same as for shop drawings. (1) Maintenance Manuals: Submit bound sets of maintenance manuals. ordinances and that the building is acceptable. (a) Remove broken or scratched glass and replace with new glass. surfaces provided as work of this Contract. (c) The entire building shall be swept out and left broom clean. Places and is of significant historical value. site without written permission from the Owner. provide an access way from the east of site. ized without Owner's prior approval. with City of St. Augustine standards and requirements. fighting officials prior to constructing barricade. disturbed or destroyed, replace as directed. free drainage at all times. Protect persons and property from damage and discomfort caused by dust. Water as necessary to quell dust. fills. Remove from site excess material and that unsuitable for filling. tect and other constituted authorities. work shown on the drawings and/or specified. Artifacts uncovered during the work, including nails, screws, pegs, etc. Existing barricade and display materials. items from site at Contractor's expense. Insure the safe passage of persons around the area of demolition. adjacent buildings, structures and persons. Provide public protection as required by the City of St. Augustine. the demolition operations at no cost to the Owner. Excavate as necessary for work shown on drawings or specified. Allow ample space for form work. Leave bearing surfaces undisturbed, level and true. Earth or gravel fill under footings not permitted. Brace and shore sides of excavations as necessary to prevent cave-ins. Remove debris and decayable matter before filling. Use approved materials only for fills. surfaces. Slope ground away from building walls to facilitate drainage. on drawings. Round surfaces at abrupt changes in levels. Should figures conflict with contours, consult Architect. the guarantee period and shall include any yearly renewal costs. trations complying with these specifications. shall be at no charge to the Owner. without cost to the Owner up to $5,000.00 in value. of guarantee to the Architect, for approval, prior to starting the work. B. APPLICATOR shall be a State licensed pest control operator. A. CHEMICALS shall be applied only in water-based emulsions. Mixtures of the above chemicals are prohibited. depth along both sides of foundations. and other interruptions or penetrations of slabs. minimum between treatment of soil and permanent covering. American Standards for Testing of Materials. 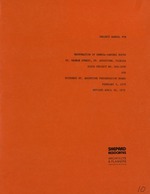 Southern Building Code, 1976 Edition with 1978 amendments. City Specifications, if more rigid than those herein, govern. Obtain and pay for all required permits; pay City Inspection Fees. slabs in accord with ACI-318-71. Cement: "Standard Specifications for Portland Cement," ASTM C150, Type 1. Aggregate: "Standard Specifications for Concrete Aggregate," ASTM C33. Reinforcing Steel: ASTM 615-72, grade 40, fabrication ASTM 315-72. Galvanized Welded Wire Mesh: ASTM A183-72. "Manual of Standard Practice for Detailing Reinforced Concrete Structures,"
Fiber-type ASTM D-1751, thickness as indicated on drawings. Submit two-foot by two-foot sample of tabby concrete to be used for slabs. (1) Cement: Non-staining white portland cement "Atlas," "Medusa,"
Trinity brand in accord with ASTM C150-74, or as determined by HSAPB staff. (2) Sand: In accord with ASTM C35-67, sharp natural fresh water sand. aggregate shall pass thru a 1/4" x 1/4" sieve. (5) Reinforcing: As specified in 3A-2B. with "Bondcrete" prior to placing topping. Slabs shall be placed as detailed on drawings, sloped to drain. Finish with lightly broomed, wood float finish. Fill holes in existing masonry. Repair and fill window and door heads and jambs as required. Fill openings as required for installation of new work. Provide all required shoring and braces. Install all lintels as required. Install nailer plugs for all items to be attached to masonry walls. Install new masonry infill as indicated and required. Install vents in chimneys as indicated. Reshape eastern chimney as indicated or required. Cut chases as required for mechanical and electrical work. Standard Building Code, 1976 edition. Lay all new masonry work required to true lines plumb and level. Reset existing masonry in accordance with best practice. Fill joints full of mortar. masonry. This includes cutting chases for mechanical and electrical work. and masonry is protected from frost until mortar has hardened. Anti-freezeingredients added to mortar or grout not permitted. Do no work unless materials and work are protected by cover. Clean top surfaces of loose mortar and wet in accordance with Par. C. above. Standard Common of Clay, ASTM C62. Hollow, load-bearing units, ASTM C90, thicknesses as required. latest edition. Utilize type "N" mortar throughout. add water-proofing as recommended by manufacturer. required. Fill all holes and cracks with mortar. fully grout with mortar specified. repair damaged areas in existing coquina stone as required. Fill all holes and cracks with mortar. Wood preservative and flame-proof treatments. Wood roof shingles and shakes. quantities required by Building Code or hereinafter specified. (wrought or cut iron nails are available from Tremont Nail Co., Elm St.
or inserts, spaced as required for a rigid and permanent installation. or specified, then must be kiln dried and preservative treated as specified. Protect lumber, plywood, millwork and casework from the weather. Be sure that building is thoroughly dry before finish woods are placed in it. Refer to "Base Bid & Alternates" for possible effect on work of this Section. where rough sawn stock is specified or special shapes are indicated. Posts, beams, joists and rafters, 1500 f working stress. Rough lumber not otherwise specified. DFPA plywood or approved, exterior type, Group 1. Company, or approved, types indicated. Secure as detailed. bearing directly on earth-supported concrete slabs. Carefully lay out, cut, fit and install rough carpentry items. Install work to true lines, plumb and level, unless indicated otherwise. Nominal 2-inch stock, width as required by conditions, or as indicated. Anchor with 1/2" 0 A.B. @ 4'-0" centers unless shown otherwise on the drawings. Set with crown side up. Block ends between studs where studs and joists are not in contact. Double headers and trimmers: spike beams with ledgers to ends of joists. Frame roofs for free flow of rain water to eaves. member at exterior wall, or as detailed. DFPA Plywood, or approved, Group 1, 5/8" thick, 24/0 C/C EXT. Lay sheets with face grain perpendicular to supports, end joints on bearings. Protect from moisture and other damage until roofing is installed. Install new roof framing as detailed. Leave existing roof framing in place. capacity of the deteriorated material as approved by the Architect. double studs at openings, triple at corners and intersections. of 2-inch material, full width of stud, at mid-point of each story. not less than 4 bolts per story. titions with 1/2" 0 AB at 48" O.C. Truss over openings more than 3 feet wide, or provide lintel of proper size. DFPA, or approved, 1/2-inch C/C EXT, Group 1, 24/0 subsheathing. with 8d galvanized siding nails at 6" centers along edges of sheets and 12"
Install at sidewalls behind siding. stretch taut and tack securely in place. Provide as necessary for work specified elsewhere or shown on drawings. Let heads and sill 1/2 inch into jambs; spike securely. near tops and bottoms of bucks, not more than 3 feet OC between. Provide P.T. S.Y.P. to match existing as required. Install running trim in as long lengths as feasible. to match existing; supplement with screws as required. at heads and jambs; clearance at sills as directed. 8d aluminum casing nails; face nail only as required; miter at borders. boards and other trim. Set joints in white lead paste. Items specified in "Carpentry at Site". Installation of finish carpentry and millwork specified herein. Finish hardware not specified herein. specified herein, or required to complete the project. Virginia, 22206, as modified herein and on the drawings. Submit in accordance with General Conditions and Supplementary Conditions. Red Cedar or Heart Pine, beaded cap joint to match original. struct with water-proof glue as detailed. S.Y.P. or Ponderosa Pine, "C&BTR"; mill as detailed or to match existing. (1) Lumber: S.Y.P. or Ponderosa Pine, "B&BTR". as possible. Construct from straight grained stock. struct from straight grained stock. lumber, or certificate of compliance must accompany each shipment. that will remain as part of the permanent construction. Structural repair of rafters and stripping. Demolition of roofs above existing construction to be removed. cedar shingle roof using materials below. applying the Class "B" System. Approved by manufacturer of roofing materials and the Architect. Shake Bureau," Seattle, Washington, and U. L. requirements. joints as recommended by manufacturer; foil to cover entire roof. Use only enough nails to hold underlayment until shingles are in place. (1) Size and type: No. 1, Koppers, red cedar, 24", sawn. Hot dipped galvanized, size and type as recommended by manufacturer. stripping to match original so as to be seen from below. Plywood sheathing and Class B roof shall be installed above these shingles. lap on windward slope of roof as determined by the HSAPB staff. Flashing of pipes passing through roof. Remove existing (if any) and install new chimney flashing, as detailed. Install new roof flashing at changes in pitch of roof and at ridges and hips. Install any other flashing as required or indicated. five-year period without additional cost to the Owner. gauges where called for in item specification or noted on drawings. is necessary for application shown and requires forming. ASTM B32, 50% pig lead and 50% block tin. Workmanship equal to best standards of modern sheetmetal practice. with lines and angles in true alignment, without waves or buckles. Cope or flange intersections to fit accurately and solder. Make exterior work permanently weathertight. Install sheetmetal and flashing in dry weather only. Put surfaces to be covered with sheetmetal in proper condition for covering. Place membrane under all interior slabs on fill. 4 mil thickness, clear polyethelene film provided in widest practical widths. Adhesive or tape shall be approved by manufacturer of vapor barrier materials. vapor barrier beyond expansion joint filler and turn up to top of slab. continuous under expansion joint filler. Protect application from damage until permanent covering is in place. the puncture 6" minimum and adhered or taped in place. Completely insulate space between framing above second floor ceiling. Completely insulalate between studs at frame exterior walls. tion thickness and R value. Owens Corning, Johns Manville or approved. paper faced fiberglass batts with stapling flanges, widths as required. end and side joints butted tight. Install with vapor barrier facing space to be insulated. Install solid in exterior walls between studs. Staple flanged edges secure to framing. Place 6-inch strip of vapor-proof paper under joints in vapor barrier. block off air movement from vents. window and louver openings, and any other openings and where noted. wood trim and where noted. Approximate color of adjacent surfaces, unless directed otherwise. Diameter 1/3 greater than width of joint where it is to be installed. Mask surfaces adjacent to joints as required for complete protection. up material to within 1/2 inch of surface. to bottom of joint to prevent adhesion of sealant to bottom of joint. Use sealant for exterior joints. Use caulking for interior joints. Mix 2-part sealant in accordance with manufacturer's directions. Apply with gun having nozzle of proper size. Fill joints and voids solid. Superficial pointing with skin bead not accepted. Remove excess material and leave surfaces neat, clean and smooth. Glazing of all new windows. Replacement of broken or missing glazing of existing windows and doors. or insects are present. No glazing in wet weather except under cover. glazed. Thicknesses are subject to normal commercial tolerances. Furnished by Owner; installed by Contractor. Goss & Goss, Pecora, PPG, Prestite, or approved. As called for in standard specifications named below. judges it applicable and as modified herein. Recommended materials and methods are mandatory. 3/16-inch heavy sheet for larger lights. Glass, glazing, weatherstripping and gasketing of doors. Installation of doors specified herein. Make proper provision for glazing and grilles where indicated. to match an existing frame at the site as selected by the Historic St.
Set joints in waterproof glue. tural Woodwork Quality Standards", 1973 edition. Same as face finishes of existing doors to remain. Installation of windows specified herein. St. Augustine Preservation Board; size shall be as indicated. Supply and install glass as specified in Glass & Glazing. Same as face finishes of existing windows to remain. Temporary enclosures, temporary heat for drying plaster. Wood furring, wood plaster grounds. at all other exterior walls. Score all stucco as indicated. Control temperature and ventilation for best results. Protect work of other trades during plastering. satisfactory to Architect at time of final acceptance. Lath Association, hereinafter called MLA. ANSI Specifications for Interior Lathing & Furring, A42.4, latest edition. Cement Plastering & Stucco, A42.2 and A42.3, respectively, latest editions. struction, 1 1/4 inch minimum. thick lath for ceilings. Equal to U.S.G. Rocklath plaster base. (1) Metal Lath: 3.4 lb./s.y., self furring, diamond mesh, galvanized. (2) Casing Beads: 24 gauge, expansion-wing type, galvanized. (4) Control Joints: W-type, roll-formed zinc, #75. As required by standard specifications, and called for on drawings. eter. Install in other locations where surface is broken, as directed. In accord with ASTM C207. In accord with ASTM C150-71, Type 1. Sharp natural sand in accord with ASTM C35-67. (1) For Gypsum Plaster: Larsen Products "Plasterweld," or approved. (2) For Portland Cement Plaster and Stucco: Larsen Products "Weldcrete,"
Sonneborn "Trimix." Sec Manufacturing Co., Sec No. 1. (1) Finishing: USG Snowdrift or equal. (2) Gauging: USG Star gauging plaster or equal. and on masonry walls, and gypsum lath elsewhere. (1) Gypsum Lath: Three coats. (2) Metal Lathing Systems: Three coats. (3) All Other Surfaces: As required by standard specifications. Gypsum Plaster: 2 parts USG Snowdrift, 1 part Stargauging plaster. Coat masonry surfaces with bonding agent before applying base coats. Wet brown coat and scratch coats prior to application of finish coats. match samples of scoring on existing stucco. Shop coats on ferrous metal. Items having complete factory finish. Wood fence (gate shall be painted). low ample time for selection; do no work until colors are approved. Deliver material in original containers, manufacturer's labels thereon. Do not open containers or remove labels until Architect inspects and approves. F. or until surfaces have thoroughly dried from effects of such weather. in tightly closed metal containers. best of their respective kinds and suitable for the intended purpose. Obtain Architect's approval before proceeding. Mix and thin in strict accordance with manufacturer's printed directions. Mix and thin in accordance with standard practice, as approved. Put surfaces into proper condition to receive paint and other finish. unsuitable and improperly prepared surfaces. hardware, plates, light fixtures and similar items. Replace upon completion. Remove doors to paint bottom edge. Employ skilled craftsmen for removing and reinstalling above items. Thoroughly clean with surface conditioner; prime with galvanized iron primer. polyvinyl acetate asphalt sealer before applying finish coats. Remove surface salt by dry brushing; fill holes and cracks. If moisture content is more than 12 percent, do no painting. If between 8 and 12 percent, treat with alkali-resisting primer. If less than 8 percent, proceed as defined in finish schedule. Clean surfaces thoroughly. Remove loose, scaly and other defective paint. Touch up bare spots with proper type primer. Highest quality, by skilled mechanics, in accordance with best trade practices. Spread material evenly, without runs or sags. Cut sharp lines against glass, other materials, and different colors. Vary shades of successive coats to prevent skipping. Prime backs of frames and trim with sealer or paint. Sandpaper exposed surfaces of doors, frames and trim between coats. Allow ample time between coats for thorough drying. Do not paint putty for at least 3 weeks after it is applied. Contractor responsible whatever the cause; refinish at Contractor's expense. Repair work damaged during construction. Leave in first class condition at time of final acceptance. edges of exterior doors as scheduled. tect, surfaces are equal to prime coat specified. One coat oil base wood primer; two coats satin exterior alkyd enamel. urethane as specified for interior floors. One coat oil base wood primer; two coats alkyd base exterior satin enamel. One coat masonry primer (tinted to match final color). One coat flat alkyd oil paint. Touch up damaged areas in shop coat with same material. Two coats polyvinyl copolymer masonry paint. (Dead flat). coats simulated oil-base White Wash W-970, as manufactured by Martin Senour. ted to match final coat; two coats alkyd semi-gloss enamel. One coat enamel undercoater; two coats satin enamel. White Wash W-970, as manufactured by Martin Senour. One coat zinc chromate primer. Two coats finish used for adjacent surfaces. One coat black galvanized iron primer. One coat dull black paint. Finish to match adjacent surfaces. Clean unprimed surfaces with paint bond solvent. Two coats alkyd gloss enamel. Rules of Association having jurisdiction govern grading of finish flooring. Each piece or bundle stamped with manufacturer's trademark and Association grade. Sleepers, 14 percent; Finish flooring, 8 percent. Test finish floors before, during and after laying, under Architect's direction. Do not take flooring into building until plaster is thoroughly dry. grees F. and not higher than 70 degrees F., for at least 3 days before laying. as indicated on drawings, to match existing; lapped long edges, unfinished. Replacement flooring in existing areas shall be milled to match existing. Made or recommended by flooring manufacturer. S4S, pressure treated as specified in Section 6C. Before proceeding, be sure that concrete sub-floor is clean, dry and level. Employ only skilled floor layers for work of this section. other damage until finish floor is installed. Lay flooring to match existing flooring in Room 210. Face nail to alternate rows of sleepers; blind nail to intermediate sleepers. Use cut nails at face nailing, wire or flooring nails at blind nailing. or length of room, but not less than one inch at vertical surfaces. than one inch at columns and other interruptions of floor continuity. Machine sand to true, even and smooth surfaces. Start with No. 2 sandpaper, graduate to No. 00. Hand scrape and sand or use small machine for inaccessible areas. Sweep and vacuum floors clean. Leave free from machine and tool marks. (Or finish as directed by Historic St. Augustine Preservation Board). Protect all floors until final finishing. Apply finish in accordance with manufacturer's directions. Allow for thorough drying between coats. Surfaces to be clean, dry and free from dirt, grease and oil. (2) Finish with three coats of clear satin polyurethane varnish. (Optional at discretion of Historic St. Augustine Preservation Board). and inspections required for his work and pay all charges incidental thereto. and equipment named in the bidding documents. and shall be standard catalog products of manufacturer. for approval by Engineer in accordance with the General Conditions. prepare such drawings and submit for approval. equipment shall be made at no cost to Owner. approval before installing materials and equipment listed. submittal data or shop drawings. shall not be withdrawn without consent of Engineer. have to be removed on account os such defects. up all finished surfaces which may be damaged as a result of his operations. free of discarded materials as directed by the Engineer. quired in walls, partitions, ceilings, or floors. joining surfaces and finishes, by mechanics of particular trade involved. and brace installed items, ready for backfilling. painted to provide a blemish-free appearance. shall be properly cleaned of rust and scale before painting. aluminum paint on galvanized piping and black paint on black steel piping. shall conform to ASA Standard No. A-13 "Identification of Piping Systems". height of letters shall be 1-in. Paste on labels will not be approved. on the unit, i.e., "A/C-1", "A/C-2". bottom of beams or joists. or tubing smaller than 1-in., 8-ft. for 1-1/2 and 2-in. piping and 12-ft.
of Unistrut. Provide appropriate fittings. movement of piping during expansion and contraction without springing. finished off on both sides of the sleeve with silicone caulk. to allow pipe to pass thru and waterproof opening after installation. and cylinder oil paste, dixious compound, or key paste. material in unions of heating piping systems. any joint. Flux shall be of silver. the pipe thoroughly reamed to remove all cuttings and burrs. between copper and steel piping. be cleaned inside and made free of oil, dirt or any foreign matter. of the building; pitch line at a constant slope for proper drainage. and conflicts with other trades and their requirements for space. Type K or L hard drawn tubing. (3) Condensate drains shall be PVC DWV. (1) PVC fittings shall be solvent cement fittings. (2) Copper pipe fittings shall be cast brass or wrot. perforations or equal product of Crane. gauge equal to H. 0. Trerice Company, No. 735-2.
bulb, thermometer range 40 degrees F to 120 degrees F., 1 degree divisions. or equal product of Aurora or Taco. seal ring and Remite seat. area of the shaft under the seal or packing. A drip pan shall be provided. pump at the time of shipment and with shop drawings. (8) Pump motor shall be non-overloading throughout the curve. within a 200-mile radius of the project site. be UL listed heat pumps and rated in accordance with ARI Standard 240-76.
be resettable at wall thermostat. Control panels shall be easily accessible. Blower motors shall be heavy-duty permanent split-capacity type with oilers. shall be constructed of 14 gage galvanized steel with baked enamel finish. brackets with integral vibration isolator, cap screw and plated washer. (1) Units shall be factory charged and ready to operate. (1) All square elbows shall be provided with turning vanes. Split Regulator manufactured by Young Regulator Company. manufactured by Young Regulator Company. submittal. Provide sample register, with finish as a shop drawing. equal product of Titus, Tuttle and Bailey, or Carnes. with 1-1/4-in. margin. Bars shall be horizontal 45 degree fixed deflection. approved equal product of Titus, Tuttle & Bailey, or Carnes. vibration, and free from pulsation, under all conditions of operation. either be removed and replaced or reinforced as directed by the Engineer. bows shall contain turning vanes. larger than 36-in. Vertical ducts shall be supported by angle iron brackets. manufactured by United Sheet Metal, or Chicago Mastic. ducts with a side greater than 12-in. shall be cross-broken. be sealed with glasfab and asphaltic mastic. 16-in. o.c. and not more than 2-in. from edge of duct. Condensate from air conditioning unit shall be insulated with 1/2-in. Resources, and requirements of St. John's River Water Management District. Well shall be drilled to a depth sufficient to provide 20 GPM. mine capability. Casing shall be 2-in. galvanized steel. working order and ready for test. Owner in the proper operation, servicing, etc. of all mechanical equipment. on system operation, changeover, and routine maintenance requirements. basis as the project progresses. and cleaning of strainers shall be limited to 30-days after final acceptance. (1) Complete all work under his section of the specifications. begin to assure design performance. and calibration and that all systems are operating as intended. final test and balance of the systems. Contractor's responsibility to make corrective actions as required. test and balance at time of Substantial Completion. etc. prior to Engineer's official Test and Balance of systems. as directed by the Engineer. and balancing valves shall be preset for designed air flow and/or GPM. system. Clean all strainers as required. system during construction which will affect test and balance. the Engineer's requirement that all controls are functioning properly. perform properly, and correction shall be made without undue delay. (a) Air distribution system and equipment. (b) Hydronic system and equipment. (c) Vibration control system and equipment. apply to work of this section. or other similar costs as required by work performed under this section. divisions or sections are herewith made a part of this section. other sections of these specifications. building construction. General Contractor will pay for power used. detail is subject to the approval of the Architect-Engineer. all changes from the Contract Drawings. to this work from the action of the elements or from any other cause. and patching shall be done by men who are experienced in the work involved. obtaining written permission of the Architect-Engineer. shall be installed by men who are experienced in this work. make electrical equipment or outlet boxes inaccessible. all boxes may register flush with finish and shall be centered properly. other source of mechanical damage. level, unless specifically approved and noted otherwise. in block wall shall not exceed 3/4-inch. No E.M.T. larger than 2-in. will be permitted. conduit above grade shall be galvanized rigid steel. poured concrete walls or ceilings nor used for exposed work. Connections to motors (maximum length 18-inches). Connections to any equipment subject to vibration. accordance with Article 346-10 of the National Electric Code. to prevent entrance of foreign material. tight by applying compound to the joints. runs where electrical wires are not called for. steel wire pulled in and the ends securely caulked. be placed at changes in direction of taps. specifically approved by the Architect-Engineer. and partitions shall be of a shallow 1-1/4-in, type. shall be furnished with a fixture stud. walls, columns and plastered ceiling. 4-in. deep, with blank covers. General Electric, Crouse-Hinds, or Raco. Type THW or dual rated THHN/THWN. drawings, minimum rating 250 volts A.C.
motor starters complete with overload protection when required. Cutler-Hammer, Westinghouse, or Federal Pacific. metal frame and plexiglass plate mounted on the inside of each door. the panelboard will be centered in the door openings. Federal Pacific, Westinghouse, I.T.E., or Cutler-Hammer. panel system for use by the telephone company as shown on drawings. of finished ceilings or walls. and all other equipment damaged thereby at no additional cost to the Owner.